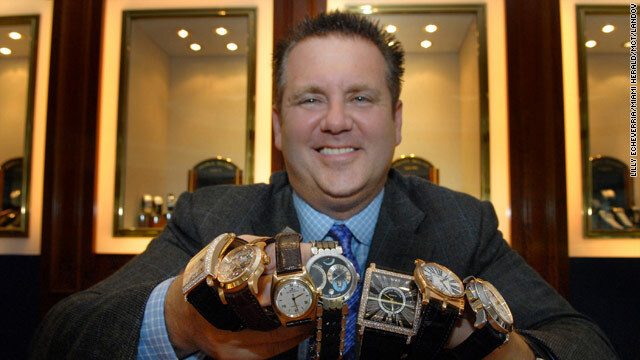 Scott Rothstein shows off his watch collection in 2007. Now, he's waiting to learn how much time he'll serve in federal prison. Fort Lauderdale, Florida (CNN) -- The photographs on the walls of Scott Rothstein's office at his law firm in Fort Lauderdale, Florida, were a who's who of Washington. There were photos of Rothstein shaking hands with former President George W. Bush and Rothstein with Bush's brother, Jeb, who is Florida's former governor. More photos showed Rothstein glad-handing Sarah Palin, Arnold Schwarzenegger and Bill Richardson. And then there were the senators: Joe Lieberman, Mel Martinez, Arlen Specter and John McCain. All appeared happy to be in the company of a man who by some estimates contributed at least $1.9 million to local and national political campaigns. The problem is, the money was dirty. Rothstein, 47, has been called the Bernie Madoff of South Florida. He pleaded guilty January 27 to five federal charges -- including racketeering, money laundering and fraud. Under his plea agreement, he admitted in court that he masterminded the largest Ponzi scheme in South Florida history. He is scheduled to be sentenced on May 6. The maximum sentence under federal guidelines is 100 years, but he could receive some credit for turning himself in, surrendering his assets and pleading guilty early in the case. Rothstein's prized political photos, along with the framed thank-you notes and luxurious office furniture, recently were auctioned to help pay down his $1.2 billion debt to investors. A political photo depicting Florida Gov. Charlie Crist and Rothstein in a happy embrace, signed "Scott -you're amazing!" fetched $2,100. A limited edition designer pen went for $3,250. While the auction netted nearly $200,000, it won't come close to paying back the investors. Nor will it repair what may be lasting damage Rothstein did to the political, charitable and social fabric of South Florida. Rothstein has been behind bars since December 1 and could not be reached for comment. His lawyer, Marc Nurik, said Rothstein has taken "a very unusual step" by surrendering and turning his assets over to federal authorities. Those assets are estimated to be worth "close to $100 million," he said. "So he accepted full responsibility for his actions," Nurik said. "His intent was to see that all legitimate investors got their money back. "Mini-Madoff," as some locals call him, was a fixture on the Fort Lauderdale social scene and a large donor to local charities. When Holy Cross Hospital in Fort Lauderdale learned of the trouble, it had to return his $1 million donation. Another charity, Family Central Inc., which subsidizes child care for the working poor, had to return a $25,000 donation. "You couldn't go anywhere here without hearing this guy's name or seeing his image. "That's the saddest part of this, the charities. It's terrible that this man's crime would impact them," said Bob Norman, a reporter and blogger who has been writing nearly two Rothstein stories a day to feed readers' insatiable appetite about the scandal, which broke in October. "This guy wasn't just any old lawyer," Norman said. "You couldn't go anywhere here without hearing this guy's name or seeing his image." "It's like Madoff, but on crack," Norman said. "He did it a whole lot faster and a whole lot wilder." A huge billboard rose in the center of Fort Lauderdale showing Rothstein with former football star Dan Marino. There were ads everywhere promoting his restaurants. At the Miami Dolphins games, Rothstein's name was announced as a sponsor. "He paid big bucks to get his name out there and absolutely all of that money was stolen," Norman said. Norman started investigating Rothstein in 2008, long before the Ponzi scheme story broke. The way Norman saw it, Rothstein's rise to power in South Florida happened too quickly. Rothstein grew his law firm, Rothstein Rosenfeldt Adler, now defunct, from a five-lawyer operation in 2005 to one that employed 70 lawyers and 150 staff members. The firm's staff included former judges, prosecutors, big name attorneys and ex-police brass. Rothstein showered gifts on all of them, including exotic cars, jewelry and boats, according to court papers. To Norman, the money Rothstein spent on his friends and on himself was just too much. "He didn't have one Bentley, he had three Bentleys. He had 20 luxury cars he kept in an air-conditioned warehouse," he said. "Everyone in town was looking at him and asking 'where is he getting all this money?' He's a lawyer, and even the most successful lawyer in this town wasn't throwing around the money that he was." When news of the Ponzi scheme broke, someone sent Norman a photo of Rothstein's his-and-hers toilets. The lids were gold-plated, each estimated to cost $25,000. Norman said one of Rothstein's investors told him: "I was lulled into believing this myth that he created. I really believed he had a golden touch. What better way to perpetuate that myth than by having a golden toilet?" Federal authorities said Rothstein used his political contributions, his donations to charities, the power of his firm and his own personal displays of wealth to earn respect and attract potential investors in his Ponzi scheme. Rothstein invited wealthy investors to his office. He told them that he had clients who didn't want to wait to collect settlement agreements in sexual harassment and/or whistle-blower cases. Rothstein told potential investors the confidential settlement agreements were available for purchase. He said the clients didn't want to wait for these agreements to pay out over time. They'd take the money at a discount if they could get it in a lump sum. The investors were promised their money back, plus the difference. The trouble is, federal authorities say, the clients and their cases never existed. Rothstein used altered bank statements, fictitious online bank accounts and fictitious documents to convince investors that the cases were real, court documents show. Hedge fund mangers, sophisticated trust directors and his friends invested with Rothstein. I went away to make sure I had my head on straight. Rothstein's scam collapsed in October when he ran out of money to pay back investors. When he realized there was trouble, investigators said, he wired $16 million to an offshore account and fled to Morocco in a private jet. He returned a couple of weeks later and explained why in an exclusive interview with CNN affiliate WSVN. "I went away to make sure I had my head on straight. I had been through all the emotional things and went through the hysterics -- all the things you go through when you've done things you shouldn't do," Rothstein told WSVN. "I will not stop until every penny is paid back," he said at the time. An attorney for some of the investors, William Scherer, said he thinks Rothstein will be the best witness for his clients when the civil case makes it to court. "I mean what does he have to lose?" Scherer said. "He was a great salesman and I just hope we can sell the jury." He said, "If anybody can steal over a billion without a gun, they've got to be good." Federal investigators said the investigation continues. They are looking into Rothstein's associates, checking to see who else might have been in on the scheme. Rothstein's lawyer, Nurik, said his client is not pointing the finger at anyone else. "He [Rothstein] says hello in court! But no, he's not cooperating with the federal authorities, other than identifying his assets, which is what he's done so far," he said. "This investigation is far from over. We will continue to unweave the schemes and the house of cards he has built," said John Gillies, chief of the FBI's Miami office. "To investors, I tell you to be aware. To those out there perpetuating these kinds of crimes, beware. We will catch you."